The longest government shutdown in U.S. history is creating more uncertainty for the current and future tax landscape. As the border wall standoff delays guidance necessary to properly implement tax reform, taxpayers are left wondering how to timely file their 2018 tax returns without ultimately having to amend down the road. Congress currently hasn’t been able to properly address technical corrections and tax extenders that impact tax policy, especially for those with real estate holdings. Additionally, recent additions to the tax code such as Opportunity Zones still need further guidance from the Treasury Department. 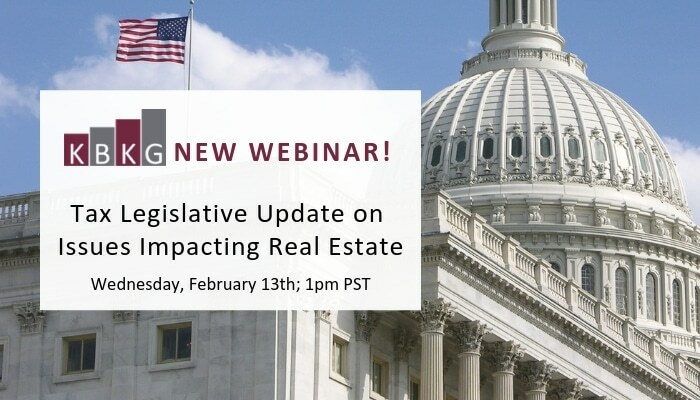 Join us on Wednesday, February 13th at 1PM PST, as we hear from special guest speaker and Washington insider, Ryan McCormick, Senior Vice President & Counsel for Tax Policy at The Real Estate Roundtable as to what to expect from Capitol Hill in the coming months. The Roundtable will address current tax policy issues, and why extending 2018 tax returns may make sense for those investing in and making improvements to real estate. Our technical experts cover this information and more during our webinar.